Parents who are behind in paying child support—called “arrears”—may, by federal law, have their payments retained by the government to reimburse cash assistance that their child’s household received from the Temporary Assistance for Needy Families (TANF) program. Because African-American families are much more likely to have received TANF cash benefits, Black parents who are court-ordered to pay child support are also much more likely to have their payments retained by the government. Child support debt totaled $113 billion as of September, 2016. $26 billion—23%—of this is assigned to state governments to reimburse TANF. Child support debt totaled $2.4 billion. $295 million—12%—of this is assigned to the state of Georgia to repay TANF. 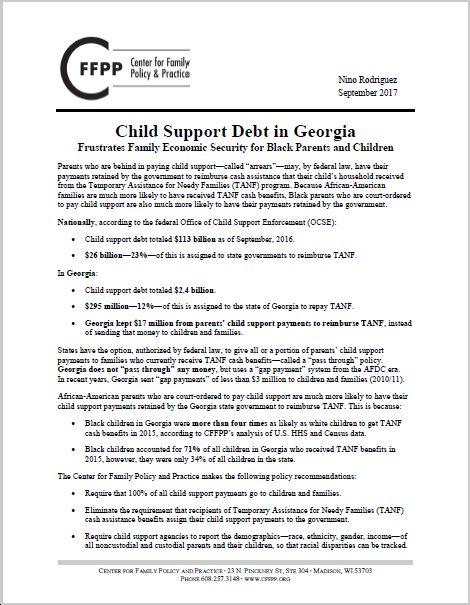 Georgia kept $17 million from parents’ child support payments to reimburse TANF, instead of sending that money to children and families. States have the option, authorized by federal law, to give all or a portion of parents’ child support payments to families who currently receive TANF cash benefits—called a “pass through” policy. Georgia does not “pass through” any money, but uses a “gap payment” system from the AFDC era. In recent years, Georgia sent “gap payments” of less than $3 million to children and families (2010/11). Black children in Georgia were more than four times as likely as white children to get TANF cash benefits in 2015, according to CFFPP’s analysis of U.S. HHS and Census data. Black children accounted for 71% of all children in Georgia who received TANF benefits in 2015, however, they were only 34% of all children in the state. Require that 100% of all child support payments go to children and families. Eliminate the requirement that recipients of Temporary Assistance for Needy Families (TANF) cash assistance benefits assign their child support payments to the government. Require child support agencies to report the demographics—race, ethnicity, gender, income—of all noncustodial and custodial parents and their children, so that racial disparities can be tracked.